Could there be a more appropriate shoe for changing seasons than a peep-toe bootie? Though we’re beginning to see the early stages of warmer days, spring isn’t here quite yet. With the unpredictable weather that occurs during the seasonal transition, it’s best to err on the cozy side, but if you plan on going out when the temperatures are above freezing, opt for the cool cutout boot. You’ll look stylish and warm, and you’ll get to show off your latest pedicure. Who wouldn't want that? While it may have been a while since you sported the open-toe boot, this cool footwear trend just got an update for 2018, which may make you give it a second look. From sock boots to lace-ups, these open-toe shoes are much more than a simple throw-on-and-go pair. This time, they're making a statement that can work now and still be a staple in your wardrobe come spring. Shop our favorites below! If you like the Yeezy sock boots, you'll love these. Wear these with a pair of skinny jeans or a midi skirt. Available in sizes IT 35 to IT 42. This patterned pair will catch anyone's eye. Velvet pink adds color without being too bright. An olive pair of shoes is always so unexpected. Dress up any outfit with these lavender boots. Black suede boots will go with everything. Tap into that lucite trend. Available in sizes IT 36 to IT 39.5. Add a pop of color with these red patent booties. Available in sizes EU 36 to EU 41. 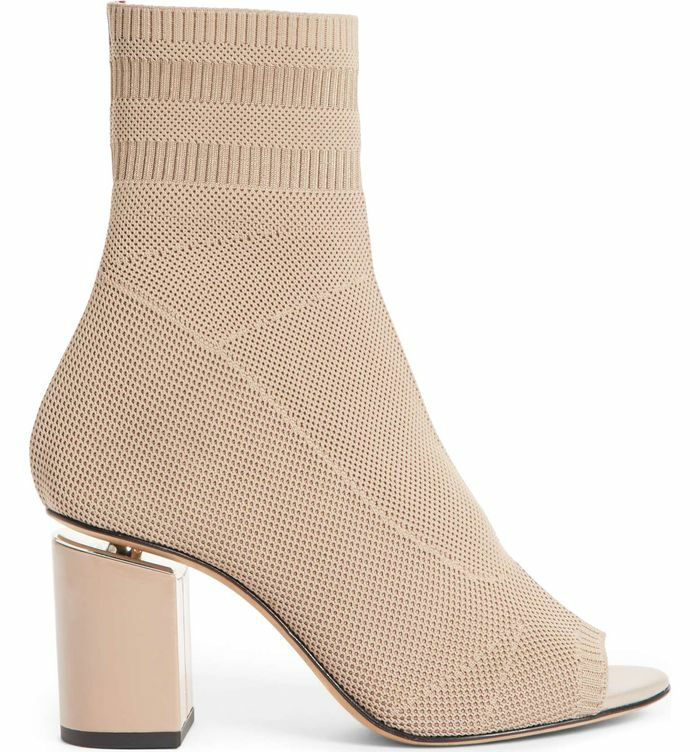 A pair of peep-toe sock boots will be perfect for spring.